Our business was founded in late 2001, when the owner of the company -- Lynn S., a mother of two young kids -- got braces in her early 40s. Very quickly she realized the challenges faced by adults and kids in braces, and created the DentaKit Braces Survival Kit. Our company has grown a lot since then, but it continues to be family-run. We're proud to have taught our kids a little something about entrepreneurship along the way. In fact, our college-bound oldest daughter just started her own photography business! As people who have worn braces and retainers, we know what you're going through. We know what works and what falls short. All of the products we sell are thoroughly evaluated before we offer them to you. We never sell products which we think are shoddy or will cause problems. And if you're not happy with something you bought, we'll work with you to get it right. We work with a professional warehouse, and our orders ship the next business day. In most cases, you'll receive your order within 5 to 7 business days, but many times it's even faster than that. Even better? All orders over $69 shipping to the 50 US states and territories can get free shipping with coupon code FreeShip69, which you can enter on the Shipping checkout page. That goes for APOs and FPOs, too. 5. We're Highly Rated and Dentists Love Us! 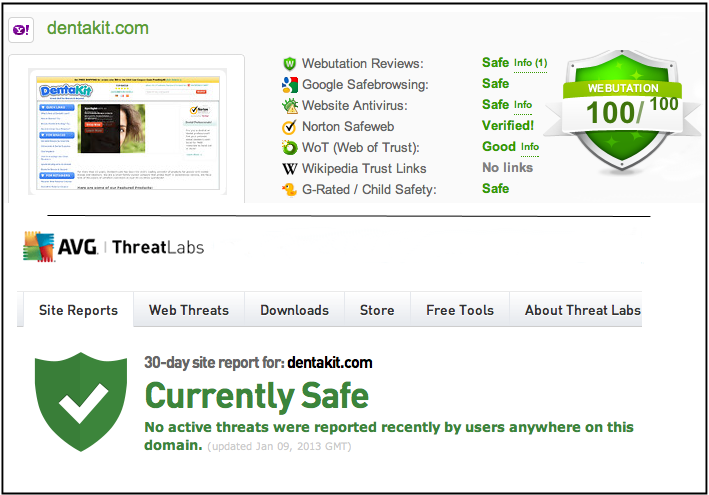 DentaKit.com has achieved the highest rating in Yahoo! Shopping, so it's no wonder that many people who find our site continue to buy from us again and again. Dentists and orthodontists across the country trust us, and hand out our cards to their patients on a regular basis. Unlike other dental websites which offer you "the kitchen sink," we concentrate solely on products for people with braces, retainers, and special dental challenges. We're always on the lookout for innovative products to help make your orthodontic experience easier and more pleasant. Choosing the right product can be confusing sometimes. We've provided convenient comparison charts for many product categories to help take the guesswork out of your purchase. We are the proud founders of ArchWired.com's Metal Mouth Message Board. ArchWired.com is our "sister" website, and is also run by our family. It's a great place to commiserate with other braces wearers, to ask a question, and get the latest information. DentaKit.com "gives back" by supporting Smiles Change Lives and The Smile Train. In the past we have also given disaster relief donations to Doctors Without Borders and the Red Cross. In addition, our family personally supports entrepreneurship in the third world through Kiva.org, and fundraising for education in our local community. We hate spam and junk email as much as you do (maybe more!) A few times per year we send out an email announcing a special sale. That's it. You won't be continually bombarded with emails from us, the way you are from other companies. We'll only contact you when we have something really important or fantastic to convey. And if you ask to be taken off our mailing list, we'll really take you off, no questions asked.